Miss Sheridan welcomes you to our Year 2 page. Here you will find out about what we will be learning this half term, as well as gain updates and photos of all of the fun we're having! At St Patrick's we follow the document ‘Learning and Growing as the People of God’. This underlines the importance of the task of exploring and handing on Catholic faith within the generations of family and Church life. It is the curriculum strategy for Religious Education in Catholic Primary Schools in the Archdiocese of Birmingham and provides the foundations for improved partnership between school, home and parish, a partnership that lies at the heart of Catholic Education. We will be studying the topic of Lent through the teachings and stories of Jesus. We will learn about the importance of forgiveness at this time. We will think about the start of Lent and being prepared to make our Lenten journey. This learning will lead us into thinking about the Sacrament of Reconciliation and we will learn that this is a special moment when we celebrate God’s forgiveness. will strengthen our knowledge and understanding of the events of this very special week. The Virtues and Values for this half term are Learned and Wise. Learned by growing in our understanding for all of our subject areas and Wise in the way that we use our learning to make good decisions. This half term, we’ll find out how to look after plants, ask the experts questions and appreciate the flowers. We’ll write an information book about plants, follow instructions, enjoy the story of Jack and the Beanstalk and write stories of our own. We’ll also learn about the different parts of a plant and create our own ‘planting and growing’ action rhyme. Our senses will help us describe and sort a range of smells and we’ll make beautifully scented products. We’ll look closely at a wide variety of plants, create detailed, observational drawings and press real flowers to use in collages. At the end of our project, we will have become plant experts! We’ll create a presentation about plants, share the information books that we have made and design a fantasy garden. The class room has been transformed into our very own scented garden. To start off our new topic we have planted our very own Antirrhinum. We will water our flowers daily in hope that when the sun starts to shine we will be able to plant them into the prayer garden. We had some much fun potting our seeds this morning. Our Antirrhinums are all labelled and are sat on the window sill. We can't wait to watch them grow! Grab a magnifying glass, change your name to Sherlock because we’re going to become street detectives! This half term, children will continue to develop their expanding vocabularies in English to effectively describe creatures, people and places. They will also learn to write instructions and develop an understanding of the features of letters, including using persuasive language. Children will also be exploring the ‘Great fire of London’ and writing diary entries as if they were there. We will follow a route around our local streets and take pictures of the buildings, businesses and plants we can see. Talking to residents about the area will help us understand how the local community has changed over the years, we will also find out about the history of our school We will study and draw maps, create a model of a local building, draw portraits of the people we have met and look at the work of urban artists. To welcome in the new year the children were greeted by a very strange, unusual object. It has come to the attention of the Board of the National Museum of Strange Objects (NMSO) that you have recently had the most unusual discovery within the grounds of your school. We are clearly interested in anything as unusual as this and would like to assess your discovery in person. However, in order to help us with our enquiries, we would be grateful if you could forward a little more information describing the circumstances of your discovery (for example, when and where it was found, the state it was found in and whether there have been any). It would be helpful if you could include a photograph or sketch of the objects discovered, prior to arranging a visit with one of our museum staff. We are very keen to know more and look forward to reading your written accounts, which, of course, we will respond to immediately. The Great Detectives of Mysterious Objects were super excited about the letter, that they all agreed to write a letter back to detail our discovery. We have been working very hard to make sure our letters are perfect for Dr. Bernard. After all we want to ensure that she comes to help use investigate. This morning we had a very exciting visit from Dr. Bernard, she came to investigate the strange object that we discovered. Dr. Bernard was amazed- she has never seen something so mysterious and beautiful throughout her career. Have you ever seen an object that looks like this before? If so what could it be? What is it like to be a scientist and investigate lots of different things? What equipment will you use to help us find out what it is? What is the strangest object in the national museum of mysterious objects? How long will it take to find out what this object is and where it has come from? Do you think the strange object is an animal? How do you know? Do you think this could be a dragon egg? Have you ever seen a dragon egg before? Did you hear on the news about the dragon? Do you think the object and the dragon are related? What weather do you think the object should be in? When Dr. Bernard arrived the children and I were very excited- we had been waiting weeks to find out what the strange object is. Dr. Bernard bought some special equipment to help her to investigate the strange object. After some thorough investigating Dr. Bernard still had no idea what this strange object is- so she asked if she could take it back to the lab to conduct a detailed investigation on it. She has promised the children that after the investigating is complete she will send a full detailed report to discuss the findings. 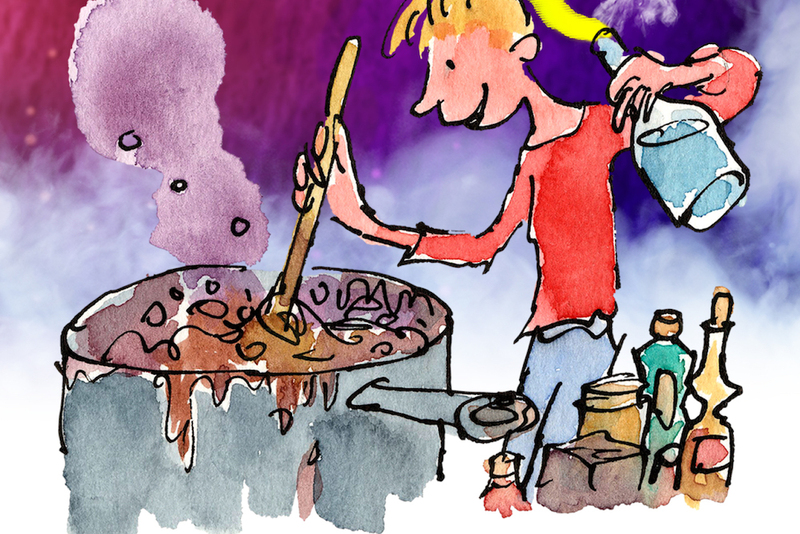 Muck and mixtures can be messy and magical! This half term, we will get very messy and we will be investigating mixtures, from paint and toothpaste to jelly and shaving foam. We’ll enjoy the story of George’s Marvellous Medicine and write recipes, leaflets, lists and stories of our own. We’ll use our science skills to explore everyday materials, investigate soap products and understand why mixtures freeze and melt. We will taste a wide variety of foods, learn about healthy eating and follow recipes to make some yummy treats including pizza and ice cream! Our artwork will also rely on our mixing skills. We’ll use marbling inks to make unusual patterns, create food landscapes inspired by Carl Warner, paint with ice cubes, model clay into exciting shapes and use a variety of materials to make mixed media collages. As a class we will be focusing on Roald Dahl's book 'George's Marvellous Medicine'. You will follow in Georges footsteps and make your own marvellous medicine! Are you up for the challenge? To help immerse the children with our new topic, I have created a potions lab within the book corner. We had a special guest come to start off our topic from the Fizz,Pop Bang science group. The children had a fantastic morning becoming scientists whilst taking part in a Crazy Chemists workshop. We explored chemical reactions; from colour changing liquids to making slimy putty. We even watched a cool mini explosion! We had a whole afternoon where we were conducting our own experiments. We predicted what we thought may happen with each one first. We are starting to become real scientists. As part of our English lesson we have been writing a revolting recipe. To help us understand the different features of a recipe we followed one ourselves to make cupcakes. We looked firstly at the ingredients and equipment to make sure we had everything ready. We then followed the step by step method. We ended up making delicious cupcakes. This term, we will visit a real castle to explore the towers, battlements and maybe a secret tunnel or two! We’ll learn all about the different parts of a castle and describe how they have changed over time. Using a wide range of materials, we’ll build models of castles and test the strength of our structures. We’ll learn the stories of Rapunzel, The Three Little Pigs and The Three Billy Goats Gruff and create models inspired by them. Maps and photographs will help us learn about the tallest buildings and the longest tunnels in the world. To help immerse the children in the Towers, Tunnels and Turrets topic I have created a castle to form part of our book corner. Year 2's visit to Warwick Castle. A very special and memorable day was had by all. I think we all wish we could go back. Following on from the trip to Warwick Castle the children wrote some amazing recounts in English. They are all superstars. The children were writing in chronological order and in the past tense. Well done Year 2, keep up the fantastic work! As part of of our literacy lessons we have been writing the ending to the story 'The Tunnel' by Anthony Browne. The children used their imaginations to write about where the tunnel in the story leads to. All of the children came up with individual ideas and each and everyone of them were AMAZING! To finish off this style of writing Year 2 invited parents and carers in to listen to their children read. This was a magical morning that all children thoroughly enjoyed. A special thank you to all those that came to join us. During our topic lesson, on Wednesday afternoon, we were making bridges out of recycled materials. We looked at different types of bridges and explored the shape of them and the materials they are made out of. In partners, the children had the task of firstly designing their bridge and then making it. We had a fantastic time making our bridges and testing how strong they were (we made a right mess of the classroom, there were pompoms, feathers and glue everywhere). important to practice spellings regularly at home with your child. Children will also be expected to practice their times tables, in Year 2 we will be focusing on the 2, 5 and 10 times tables. Children will be given a times table test weekly. Please find time to listen to your child read at least three times a week and record it in their diary. We have introduced a new reward system in which children who have read three times a week will get a star sticker on our class reward chart. Homework is handed out each Thursday and collected back in on the following Wednesday. Please ensure only one page is done per week in each booklet. It is important that your child has access to a water bottle every day. Please ensure all items of clothing are named so that nothing gets muddled or lost! Try these fantastic games at home! Oxford Owls A great web site to access lots of FREE ebooks at home. Happy reading!